Tonight at 7:15 p.m. 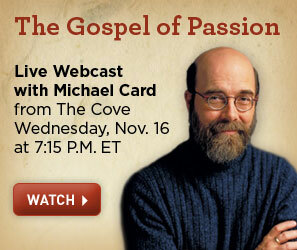 ET, we are pleased to present a free webcast session of Michael Card’s seminar, The Gospel of Passion. Make plans to join us to learn a side of Jesus we don’t know as well—His emotional side. While Michael Card is widely known for his musical accomplishments, he received a calling at the age of 14 to teach. The musical career was not his idea. As he was getting his education to become a Bible teacher, one of his professors asked him to start writing music. When he teaches at The Cove this week on the Gospel of Mark, he will be excited to get back to his roots of teaching. Joy Allmond of BillyGraham.org spent some time with Michael to ask him about this. This week is National Collection Week for Operation Christmas Child! If you live in the Asheville area, or you are coming for an event, you can bring your shoebox gifts to The Cove! That’s right, The Cove is a relay drop-off location this year. Just pack your shoebox gift (click here for some great gift ideas!) and bring it by anytime between 8 a.m. and 8 p.m. Nov. 14-21. Here’s some more information about Operation Christmas Child – it’s the world’s largest Christmas project and a part of the international Christian relief and evangelism organization Samaritan’s Purse. Since 1993, Operation Christmas Child has delivered more than 77 million gift-filled shoe boxes to needy children in more than 130 countries. For more information, visit www.samaritanspurse.org/occ. This Veterans Day, we want to say thank you to all of our military personnel, both past and present, who have served our country to protect the freedoms we all enjoy. We love you, and we pray that this Veterans Day you will know how much we appreciate your service. At The Cove, one way we show our appreciation is through our scholarship program for active-duty military. We are pleased to offer full scholarships for active-duty military personnel and their spouses to attend a seminar here at The Cove. Come renew your spirit through encouragement and sound biblical teaching from respected Christian speakers. “From the bottom of my heart, I would like to extend my highest gratitude of appreciation for providing such a wonderful weekend at The Cove in Asheville, NC; with the Billy Graham Evangelistic Association. We had an absolutely wonderful time at The Cove, as their hospitality and accommodations were extremely superb and unmatched.” — Maj. Ross Lightsey, Sr. 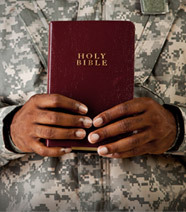 If you are on active military service or serve as a current military chaplain with the North American Mission Board, please call us at (800) 950-2092, between 9 a.m. and 5 p.m. ET, Monday through Friday to learn more. If you are not in the military, but you would like to show your support, you can give to our scholarship fund to help make this program possible. We can’t do it without your help! Contact Anna Contoleon at The Cove (828) 298-2092. Today is Billy Graham’s birthday! As he turns 93 today, he shares his hopes, struggles and prayers, and his gratitude for each of you. Through the miracle of technology, God is graciously allowing me to proclaim the Good News in several countries this year—three of them where I never had the opportunity to lead a Crusade. As I turn 93, I am thankful to the Lord that not long before my birthday, I was able to complete a book I’ve been working on for some time. The book is called Nearing Home, and it’s about how to prepare for and face the challenges of growing old, and how to finish well. I’ve written down lessons and insights I wish I had learned earlier in life, because I have come to realize that although I know how to die, no one ever taught me how to grow old. Even as I look forward to seeing Jesus Christ face to face, and to being reunited with Ruth, my parents, and a host of friends who have now gone on before me, God continues to give me time on earth. My failing eyesight keeps me from reading as I once did, and my physical stamina is low, but I have more time to pray. I talk to the Lord about the needs of family and friends, and about the work of evangelism that God has called us to at BGEA. Read the complete letter here. To send personal greetings to Billy Graham, post comments on his Facebook page at www.facebook.com/ReverendBillyGraham or on Twitter using the hashtag #happybdaybillygraham. Billy Graham Sermons Available Online! Have you heard? The Billy Graham Evangelistic Association has launched – for the first time – an online audio archive of Billy Graham’s sermons. The searchable database, which you can find at www.billygraham.org/audioarchives, contains 1,673 messages spanning the more than six decades of Mr. Graham’s worldwide ministry. You can search the database by topic, date or location. This project is unique in that such a large amount of data is being shared with the public in one location. Previously, one would have to request hard files, transcripts or rely on outside sources to find Billy Graham messages for use. Audio can be streamed, but not downloaded. We hope you are as uplifted by these messages as we are. Have you ever noticed how life’s distractions and temptations can change your spirit? Think about it. You go into work in the morning with a smile on your face and a song in your heart, only to overhear a co-worker denigrating your abilities in front of your boss. How do you react? Later you have an opportunity to work your way out of a difficult situation by bending the truth to fit your needs and cover your back. How do you react now? Finally, you see an accounting error that could add some extra money to your paycheck if you simply stay quiet and do nothing. With all of these frustrations and temptations piling up, you probably would not be feeling overly spiritual at that point. The fact of the matter is that in our fast-paced society, with so many different distractions around every corner, it is easy to be filled with a worldly mindset and not filled with the Holy Spirit. That, however, is no excuse. Frankly, we are commanded to be filled with the Holy Spirit. What does this mean? It means that you are to be under the total influence of the Holy Spirit—God, dwelling in you, ordering your steps. Stephen, the first Christian martyr in the Scriptures, gives a beautiful picture of someone who is filled with the Holy Spirit. Acts 6:3 and 7:54-8:1 offer a few key characteristics in this example of a man who was facing the cold reality of death at the hands of an angry mob. First, someone who is filled with the Holy Spirit is of good report (6:3). It is not that having good report—being known by others as virtuous and pure—fills you with the Holy Spirit, but it is the Holy Spirit that allows you to have this trait. The Sanhedrin were opposite of this. They called murderers, betrayers, stubborn, and disobedient (7:51-53). Why? Because they resisted the Holy Spirit. They wanted nothing to do with the Holy Spirit. Second, unlike the Sanhedrin, those who are filled with the Holy Spirit welcome the truth (7:55-56). Stephen sees Christ standing at the right hand of God, and he commits his spirit to God. He was glad to see Jesus and trust Him with his spirit. Those who are not filled with the Spirit were the same ones that—in verse 57—began to “cry out in a loud voice” because they heard truth and wanted to drown it out by their own words. They also covered their ears, trying to prevent the truth from affecting them. Finally, those who are filled with the Holy Spirit will intercede for others (7:60). Stephen was falsely accused, falsely arrested, and was about to be stoned, and yet he prayed for those who were about to stone him. What compassion! The only way Stephen could do this was because he was filled with the Holy Spirit. This was not a one-time deal but a way of life for Stephen. Acts 6:3, 5, 8 and 7:55 all state that Stephen was a man who was filled with the Holy Spirit. This needs to be a way of life for us as well. Too often we only want to be filled with the Spirit on Sundays, and as soon as we leave church, we return to our worldly routines of mundane tasks, acceptable temptations or angry confrontations. Being filled with the Holy Spirit—being of good report, welcoming the truth, and compassionately interceding for others—has a lot to do with your effectiveness as an evangelist for the cause of Christ. If you are someone who truly wants to reach the lost (a motivation all believers should share), you need to walk the walk, not just talk the talk. If you have been witnessing to that friend from work, but then turn around and terrorize your colleague for speaking ill of you, or bend the financial rules for dishonest gain – My friend, you are doing more harm than good for the Kingdom of God. Conversely, if you are living a Holy Spirit-filled life, in which—much like Stephen— you take the distractions, frustrations and temptations of this world and handle them with the purity, truth and compassion of the Holy Spirit, others will want to know what it is that makes you tick. They will want to know what is missing in their life that is present in yours. My friends, be filled with the Holy Spirit. Eternity is at stake. Will Graham is the third generation of Grahams to proclaim the Gospel under the banner of BGEA. Will has spoken to audiences around the world. He graduated from Liberty University in 1997 with a Bachelor of Science degree in Religion and in 2001 graduated from Southeastern Baptist Theological Seminary with a Master of Divinity degree. He currently serves as assistant director of the Billy Graham Training Center at The Cove in Asheville, N.C.
Tonight, you can tune in at 7:15 ET for the first session of Tullian Tchividjian’s seminar, Jesus + Nothing = Everything…for free! We all need the Gospel. It is every bit as important for growing in Christ as it is for becoming a Christian. Allow the Holy Spirit to pull you deeper into the Gospel as you rediscover its necessity, beauty, and brilliance for everyday life. Understand how it all adds up—Jesus plus nothing equals everything you need to live with boundless courage, audacious freedom, bold sacrifice, and heroic generosity. Click here to watch online! 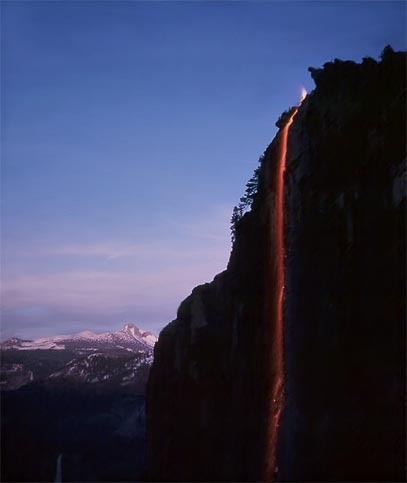 When I was 10 years old, my father took me to Yosemite National Park in California. And, there at Camp Curry (which is today called Curry Village®), the National Park guide was talking to us about Glacier Point – the face of the mountain that extends more than 7,000 feet above Camp Curry, commanding your attention from the valley floor. And, up on the mountain, there were guys with pusher boards with poles. They pushed that great big pile off the ledge, and those coals cascaded down the face of the mountain. We all said, “Oh, look at that.” They did that time and time again. They stopped it now many years ago. Clifford Burton Barrows (born April 6, 1923 in Ceres, California) is the longtime music & program director for the Billy Graham Evangelistic Association. He has been a part of BGEA since 1949. He is best known as the host of Graham’s weekly Hour of Decision radio program, and the songleader and choir director for the crusade meetings. Cliff appears regularly at The Cove, including SeniorCelebration events and Christmas at The Cove. Visit www.thecove.org for more info. The Gospel is not just for those outside the church. It is for Christians as well. Listen here as Tullian Tchividjian talks about this concept. It’s a preview of his upcoming book, and the topic of his seminar at The Cove Oct. 31 – Nov. 2. Click here to learn more. 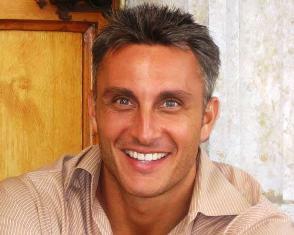 And, follow Tullian on Twitter! Jesus + Nothing = Everything: Intro from Crossway on Vimeo. One of the most remarkable realities we discover in our relationship with God is that He will never be in debt to us. No matter how much we give or how much of ourselves we pour out for His sake, He always manages to give back more than we gave. That God honors those who honor Him was never more evident than in the life of Daniel. Tonight, we begin a seminar with Bob Coy, studying the life of Daniel, whose unwavering faithfulness, persuadable leadership, unquestionable integrity, and influential vision enabled him to honor God. You can tune in to the first session live on the Web for free. You’ll learn to cultivate these character traits in your own life and be prepared to seize every opportunity the Lord provides to honor Him. Join us tonight at 7:15 P.M. ET for a live webcast of Bob Coy’s seminar, Daniel: Honor for Honor.